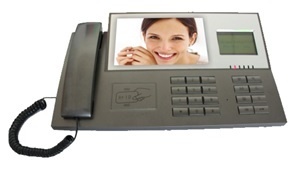 The BE109 Video Intercom Management Console is our indoor, two-way communication entry station. Apartments & condominiums, business offices, parking garages & high complexes, schools & colleges and assisted living facilities are only a few of the many types of venues that utilize our BE109. With a fully functional seven inch TFT screen, the BE109 offers LCD display with menu operation. The BE109 offers monitoring features, two-way calling, alarm and door unlocking capabilities all from this main console. With the ability to store past images, the BE109 offers constant surveillance of entryways. The BE109 has hands-free re-dial capabilities and includes a remote to unlock any door. The 14.2 inch wide by 8.5 inch high by three inch deep console is our table model. For more information regarding our BE109 please contact us.